A well-designed diaper bag is an essential survival tool for the tired and overworked mother. So what is the main thing to look for in a diaper bag? We cannot overstate this enough. When it comes to storage space and pockets, do not economize. You will find bags with 12, 14 and even sixteen pockets. Yes, sixteen. Why? Think diapers, wipes, changing pad, bottles and binkies, toys, snacks, rash cream, spare bags for dirty diapers, change of clothes, and you get a general idea. And that is just for the babies! You also need extra space for your stuff, keys, glasses, sunscreen, hand sanitizer, snacks, the works. So the more pockets and storage space, the merrier. Looks alone should never be the deciding factor when buying a diaper bag. That compact tote bag may look very chic, but it will drive you crazy when you are stranded without enough spare diapers for your twins. That being said, as long as there is adequate storage, and enough space for organization and order, you might prefer one style over the other. Backpacks offer the best in terms of function, with extra space and leaving your hands-free. But you should never hand them from strollers. Messenger bags offer wonderful comfort with padded straps, and leave one hand free to hold the baby. They also look good and work well with strollers. Totes offer the best value in terms of style and may be the preferred option for ladies who need something that can do the job of a purse as well. Use easy to clean bags, preferably with wipe clean linings. Organic cotton is probably the best fabric option. Avoid any PVC materials that are not rated "phthalate-free." Also, avoid Velcro straps as they tend to be noisy and can wake your baby. Zippers and magnetic closures are great. Ensure that at least a couple of compartments are water-proof so that you can store used diapers safely. This is a full set of bags including a large backpack, extra mesh bag, a padded changing station, couple of insulated bottle bags, and a translucent wipes case. It has 12 different pockets, dispersed inside and outside the bag. The roomy backpack is available in a functional black color and is made from easy to wash nylon. It is not very stylish and focuses more on being functional. This could be a good bag for both moms and dads to carry. Overall build quality is not too great. This is another functional black backpack that is not going to win any style competition. It is made from safe, BPA-free polyester, with a soft polyester lining that is rated phthalate free. The backpack comes with an insulated bottle holder, a changing pad, a small pouch and stroller straps. The main compartment is very spacious, and you also get fourteen different secure pockets. Like most backpacks, it scores low on the style quotient, but has ample storage and functionality. Lots of room for two babies' stuff. Easy to organize things due to the number of pockets. Changing pad is quite large. Zippers are a bit flimsy. A polka dotted backpack in neutral gray color, this one has plenty of room. There are several zip pockets, at least one of which is water resistant. The main compartment is spacious and can hold a lot of gear. There is a handy wipe dispenser on the side. You also get hidden zip pockets, insulated bottle pocket, stroller clips and a matching changing pad. With the silver and polka dot design, this one is much better suited for moms! Made from easy to clean polyester. A laptop friendly mesh pocket inside. A side pocket with tissue dispenser. The wipes pocket may be a bit too small. The actual product has a silver color, not gray as advertised. This bag can either function as a tote or as a messenger bag. It comes in a classy gray-white finish and is made from high quality polyester. The included stroller clips increase the overall versatility of this bag, while the 16 pockets ensure that there is ample storage room. This stylish bag uses magnetic clips on most pockets, while the main compartment has a zipper. It is phthalate free and safe for your babies. This is an excellent unisex product that doesn't compromise on style and looks. Extreme flexibility, can work as a tote or messenger bag. A very stylish and fashionable looking bag. Has 16 pockets for proper organization and storage. Great choice for both moms and dads. A bit less room than a backpack. 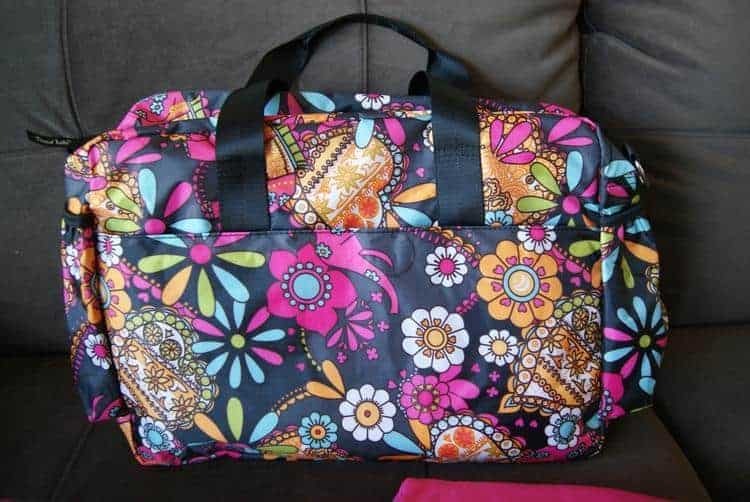 This is probably the most visually striking diaper bag on this list, with is vibrant floral prints. It is also a large duffel bag, not a tote, messenger or backpack. While it does not have dozens and dozens of pockets, it is made from natural cotton, with a polyester coating lining. It does come with a changing pad, as well as a waterproof pocket to hold the dirty diapers. The pockets and compartments and very large and spacious. Cotton will get wet very easily. From this shortlist, the clear winner has got to be the Skip Hop Duo Double Signature Diaper Bag. We were floored by its simple elegance and versatility. It can work a tote for the moms, and as a handsome messenger bag for the dads. It has ample space and carrying capacity, and uses magnetic clasps instead of less reliable zippers. It can even attach to a stroller. It is rated phthalate free and has a robust build quality. It has enough room to carry the supplies for two kids, and is a great diaper bag for two.